Perhaps you’re planning a weekend getaway from Buenos Aires. You might be doing an Argentinian visa run. 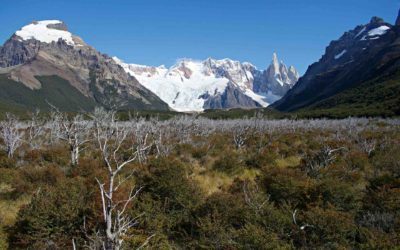 Or maybe you’re moving on to your next South American backpacking destination. 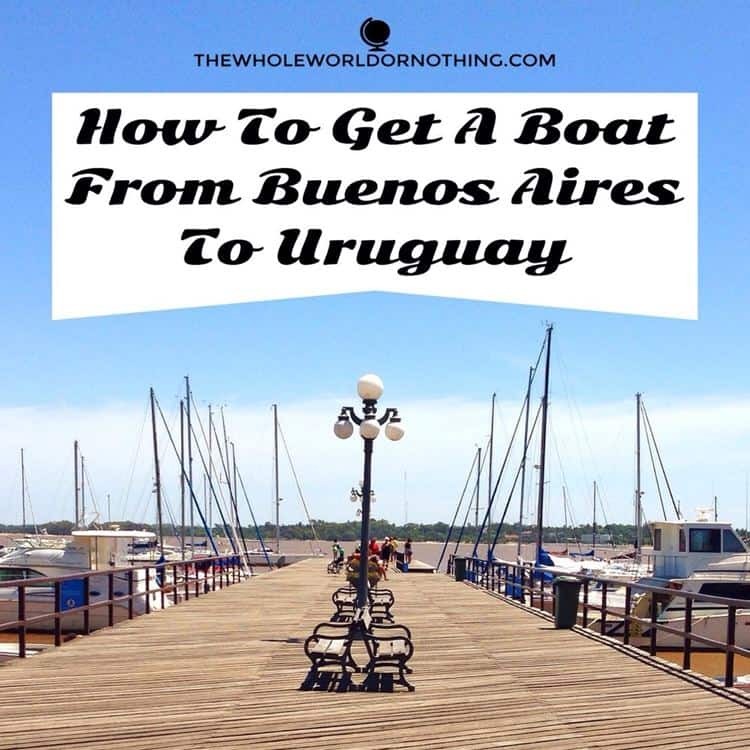 Regardless of your reasons, here’s everything you need to know about getting a ferry from Buenos Aires to Uruguay. You can of course go by air or road. But getting a ferry to Uruguay from Buenos Aires is what we would recommend because it’s quicker and cheaper. 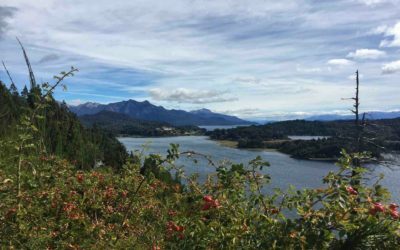 The first thing you need to decide when taking a boat from Buenos aires to Uruguay is whether you want to head to the smaller, picturesque, historical port town of Colonia del Sacramento, or the larger, bustling, trendy port city of Montevideo. There are options to get a direct ferry to ports at both. However, because Colonia is closer, it is usually the cheaper route. 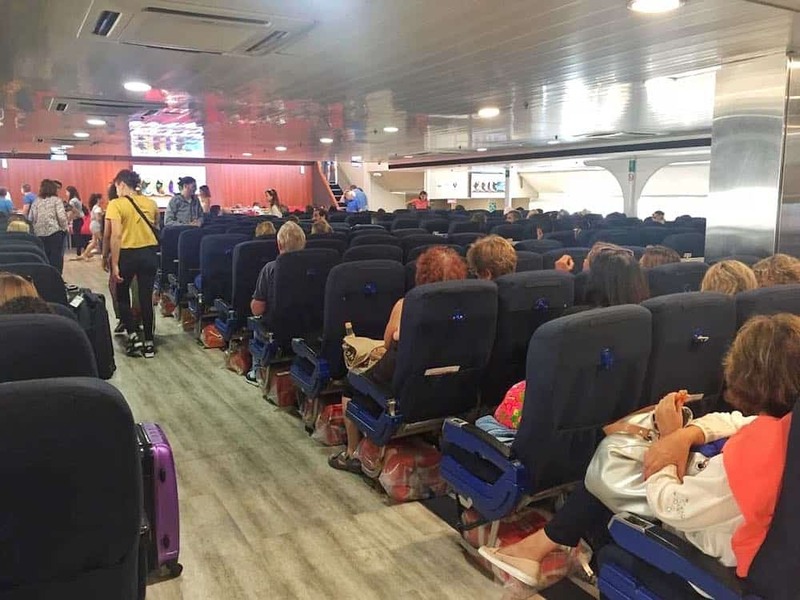 If you are wanting to head straight to Montevideo, you can can also take a ferry to Colonia and then a connecting bus direct to Montevideo. There isn’t a direct ferry to Punta del Este. To get there you need to take a ferry from Buenos Aires to Colonia and then a 4 hour bus from there. Or alternatively opt for a direct Buenos Aires to Montevideo ferry and then a 2 hour bus from there. There are three companies that you can use to take a ferry from Buenos Aires to Uruguay: Buquebus, Colonia Express and SeaCat. We found Buquebus and Colonia Express to be the cheapest and have used them both. 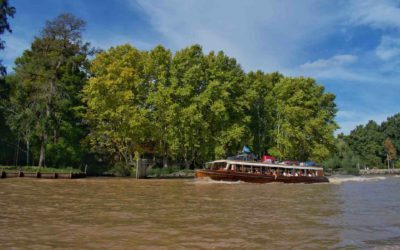 The Buenos Aires to Colonia ferry takes either one hour or three hours depending on whether you opt for a catamaran or the larger ferryboat option. Thankfully there’s usually little to no difference in price so you should always check the journey time and choose the fast ferry. The ferries from Buenos Aires to Montevideo take between 2 and 3 hours depending on which ferry company you are going with. Buquebus runs 13 times per week with a journey time of 2 hours 15 mins. And Colonia Express 3 times per week with a journey time of 3 hours 30 mins. We paid around £45 GBP / $58 USD each for the ferry from Buenos Aires to Colonia. This was for a one way foot passenger ticket. 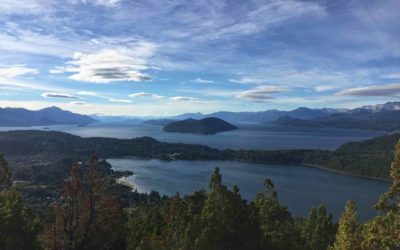 If you have a car or have hired a car in Argentina, there are ferry crossings that you can also book cars onto. It generally isn’t any cheaper to book return tickets. But it is cheaper to book online in advance. Ferry tickets direct to Montevideo are more expensive at around £220 GBP / $281 USD. So if you are going from Buenos Aires to Montevideo it will be cheaper to take a ferry to Colonia and then a connecting bus direct to Montevideo. Seats aren’t assigned but there are plenty and they are comfortable. If you need to charge anything there are a few plug sockets to be found but not many. So it’s best charge your gadgets before you leave to get the ferry from Buenos Aires to Uruguay. Up until only a few years ago, the cost of a ferry to Uruguay from Buenos Aires was much cheaper, making a Buenos Aires to Uruguay day trip way more affordable. Of course it is still doable, but we just wanted to mention this as many outdated guides provide old prices. 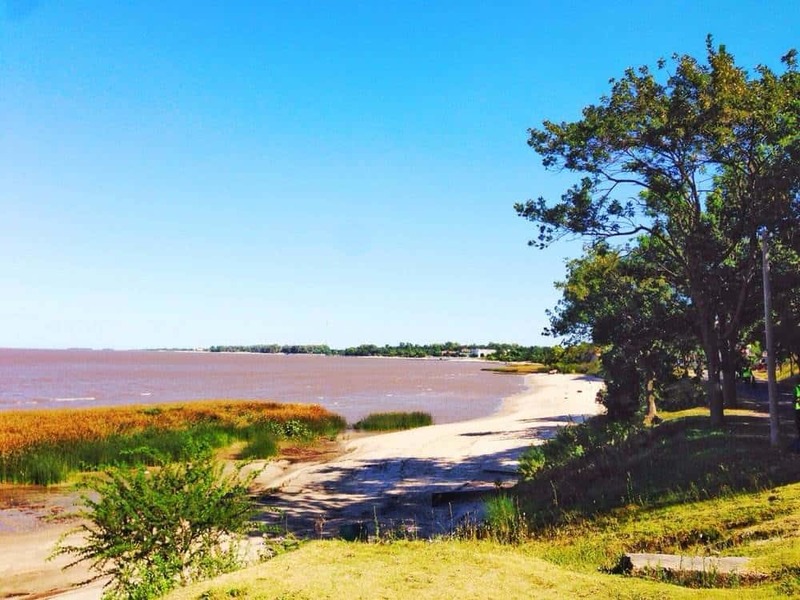 If you still want to do it, the best option is a day trip to Colonia from Buenos Aires. This will cut down on both travel time and expense. 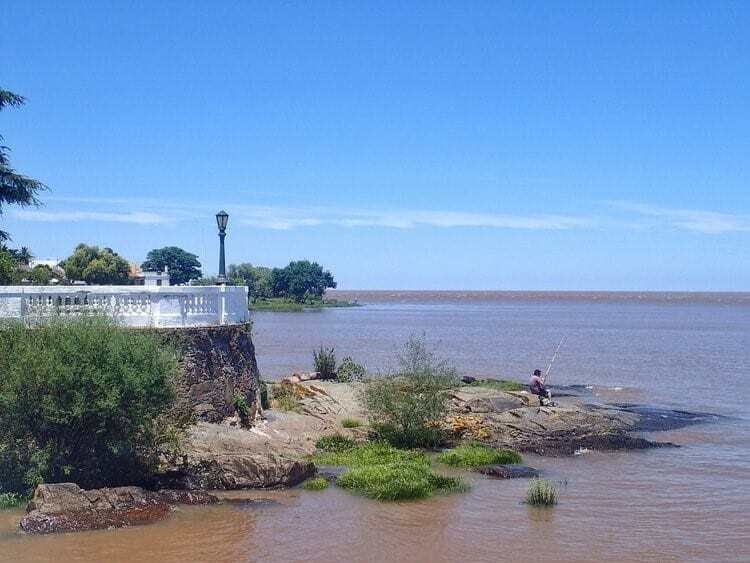 The Portuguese founded, colonial town of Colonia is a lovely chilled out place. And there’s plenty to do for a weekend if you do decide to stay overnight. 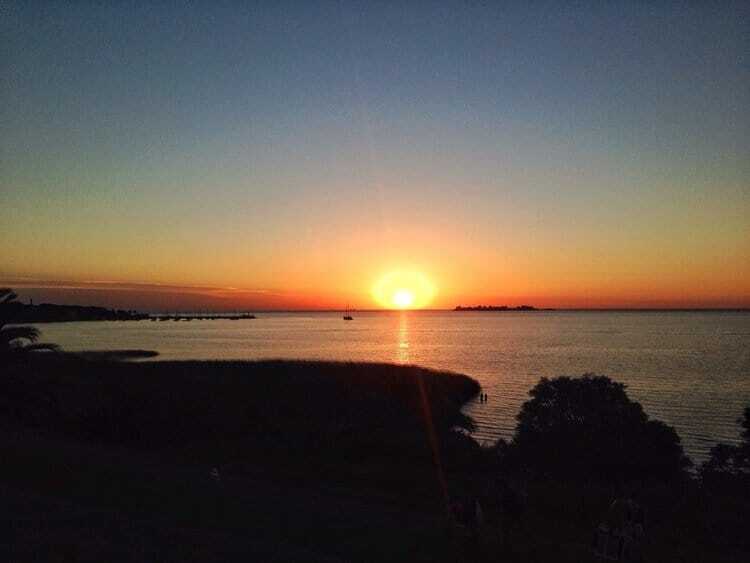 If you have a few more days to play with or are leaving Argentina to travel in Uruguay, our advice would be stop off in Colonia del Sacramento before heading to Montevideo. Even if just for the day. The walled town is a UNESCO world heritage site after all. 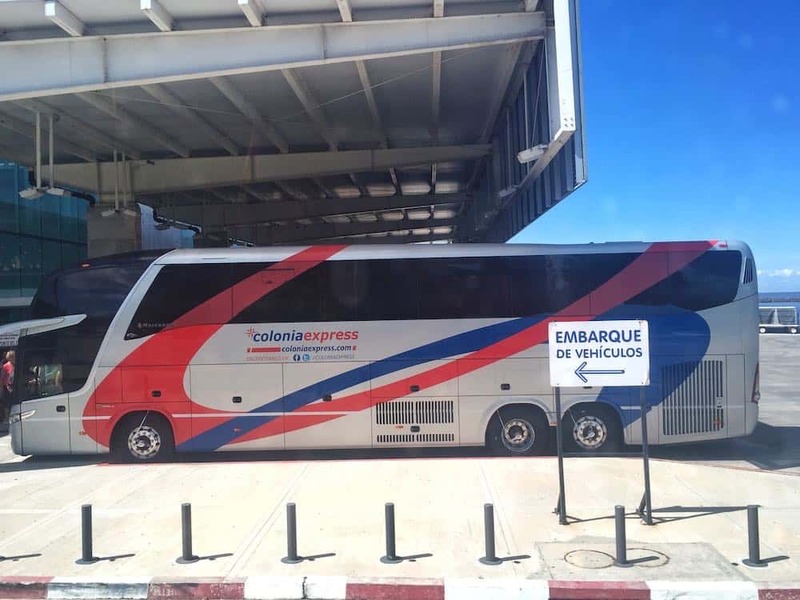 If you choose not to get the direct ferry from Buenos Aires to Montevideo, you’ll need to catch a connecting bus from Colonia. Buses run from Colonia to Montevideo every hour and it’s around a 2 hour journey. 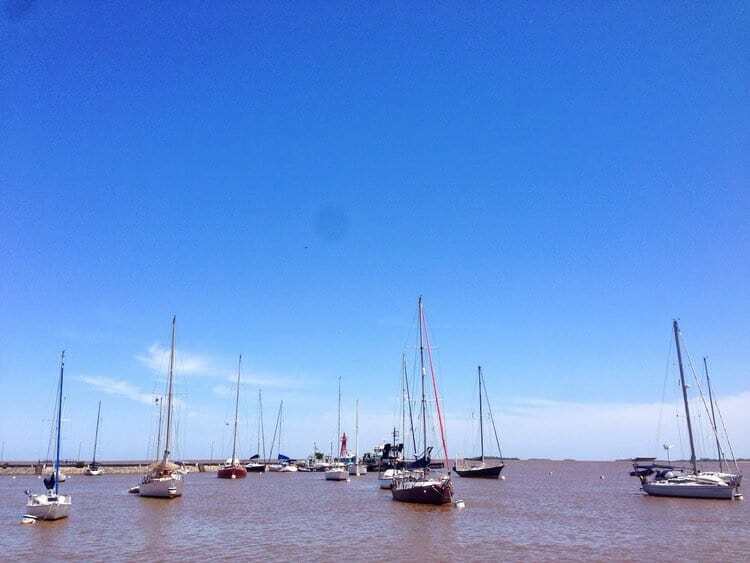 If you get an early boat from Buenos Aires to Uruguay you will have time to explore Colonia. A great option is to take a look around and have lunch before getting an evening bus to Montevideo. If you choose to do this, don’t book a boat-bus combo ticket for your ferry from Buenos Aires to Uruguay. Your bus will leave too soon after you dock into the port for you to do anything in Colonia. Instead, book your bus ticket to Montevideo separately when you get to Colonia. From the port, turn left and it’s a 10 minute walk into the town, or turn right and it’s a few minutes walk to the bus station. You can also leave your luggage in lockers at the bus station so you’re not carting them round all day. There are loads of different bus companies running the route between Colonia and Montevideo. We used the company COT, the buses were really comfortable and had decent wifi onboard. We paid $383 UYU (£9 GBP / £12 USD) each. You can also check and book buses around Uruguay here, if you’d prefer to do it in advance of getting to Colonia del Sacramento. All ferries from Buenos Aires to Uruguay go from the same port, Puerto Madero. The easiest way to get there is to take an Uber, especially if you have a backpack or suitcase. From where were staying in the neighbourhood of Palermo it cost us just £3.30 GBP / $4.20 USD. It takes around 20-25 minutes from most central neighbourhoods. 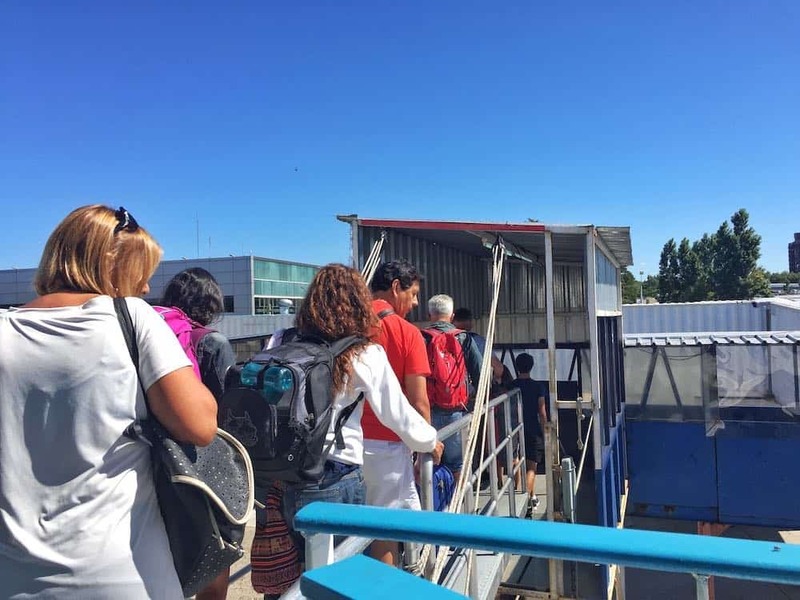 Be sure you go to the right termianal of Buenos Aires Ferry Port. Because the Buquebus and Seacat terminals are at the top of Puerto Madero and the Colonia Express terminal is at the bottom, a 45 minute walk away. You will need to get there 1 hour and 30 minutes before the departure time for your ferry from buenos aires to uruguay. Please note that you will also likely need to have your ticket reservations printed. It will say on the information when you book it. The buquebus terminal can be a little overwhelming upon first arrival, mainly because it’s so busy and it’s difficult to see where you need to go. There are different desks for collecting tickets, checking in and purchasing tickets – which is another option. Although in summer, taking a trip from Buenos Aires to Uruguay is a very popular thing to do amongst Porteños. 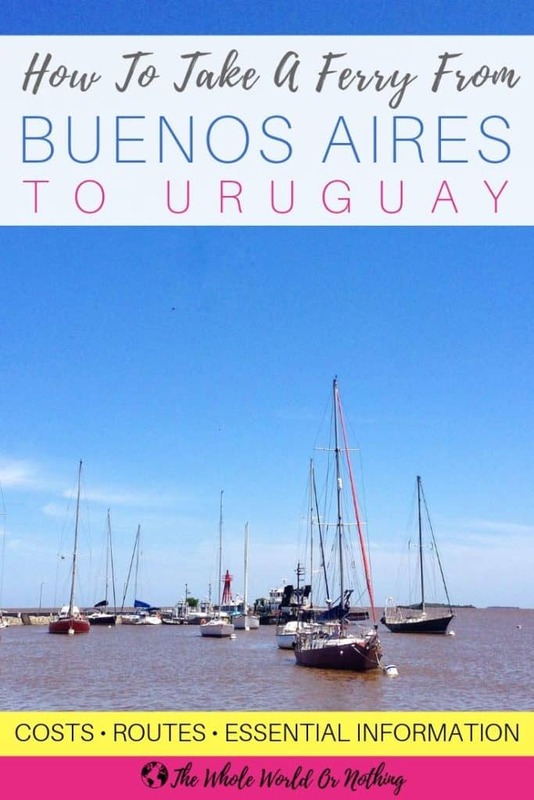 So we’d always recommend booking your ferry tickets from Buenos Aires to Uruguay in advance. Also, because Buquebus and SeaCat run from exactly the same port, they frequently interchange their services. So even if you have a ticket booked with one company you could be put on the other company’s boat. If you are in any doubt, ask. The Colonia Express ferry terminal is newly built so is way more organised and efficient, it was relocated from La Boca to Puerto Madero. Check in is pretty easy. You just present your printed reservation and ID, collect your tickets then go through the bag scanner. Next up is immigration. Just be aware that they do both your Argentina visa exit stamp and Uruguay visa entry stamp here. Once you’ve been seen by the Argentinian side you’ll be directed to a Uruguayan booth. 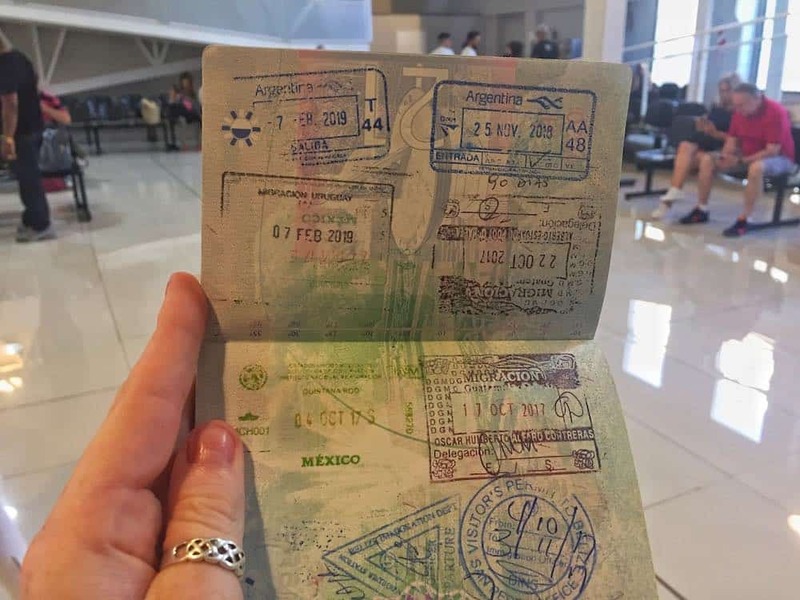 So make sure you don’t miss getting your entry stamp to Uruguay. Once you go through passport control at the ferry port, there isn’t anywhere to get a coffee other than a crappy drinks machine. So make you sure you get something at the cafe before you go through if you haven’t had breakfast. And you can take drinks i.e. liquids through check in. It’s a boat, not a plane. There are small shops on the ferries too but they are super expensive. Like $2.50 USD for a small pack of Oreos expensive. The aircon was blasting on the last ferry we went on, so be sure to have a sweater handy. Even if it’s hot outside. Announcements happen in both English and Spanish. So don’t worry if your Spanish isn’t great. If you are going straight onto Montevideo or Punta del Este, when you get off the ferry from Buenos to Uruguay the buses will be waiting for you. There’s a cashpoint in Colonia ferry port if you need to take out cash, but don’t dawdle if you’re travelling in a pair and want to sit together. Depending on the time of year, there may be an hours time difference from Buenos Aires to Uruguay. If you are just taking a short trip from Buenos Aires to Colonia del Sacramento, you don’t have to worry about getting money changed. Argentinian pesos are widely accepted by shops and restaurants in Colonia. And there’s no need to take a cab or bus, it’s just a 10 minute walk. If you haven’t left on your travels yet, or even if you have, don’t forget your travel insurance. Uruguay is a very safe country. But accidents happen all the time and the last thing you want is to be stuck abroad without good insurance. 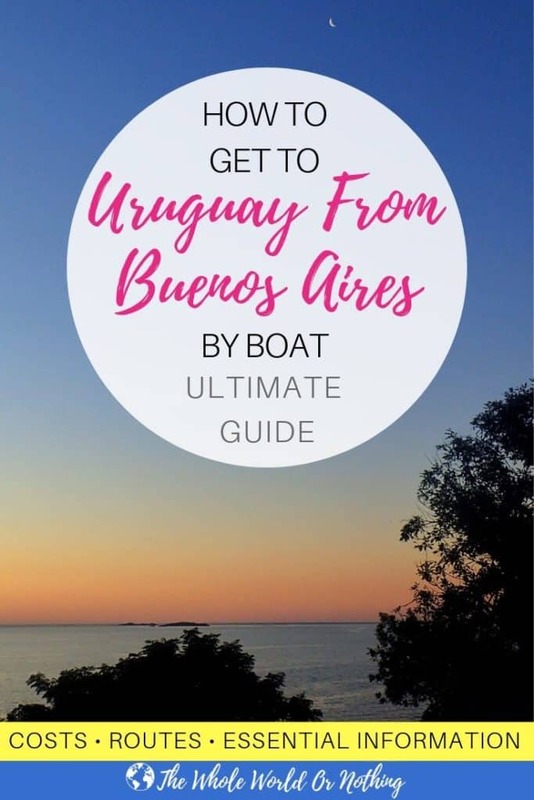 You may also find our guide to planning a perfect trip to Uruguay helpful. And if you have any other questions about how to get a ferry from Buenos Aires to Uruguay, drop us a comment below and we’ll do our best to help. This was so helpful! I’m thinking of heading to Argentina this year and was thinking of doing a quick few days in Uruguay. 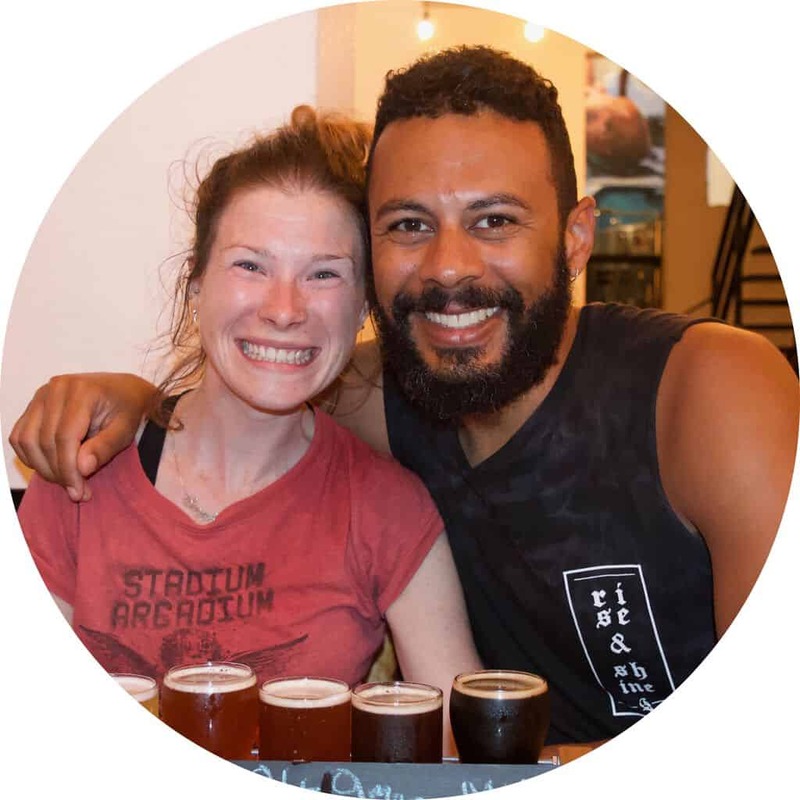 Thanks for sharing the details of your trip! Thank you. All the information I had been seeking in one place. Helping my planning enormously. Much appreciated. You’re very welcome – hope you have the best time. We’re heading back over this way soon. Thank you for the detail here – i’ve been researching the ferries and trying to figure out which port is best to arrive into from BA. This is really helpful! Hey Emma, glad you found it useful. We are actually in the process of updating the post with even more detailed info, as we took the ferry ourselves again just a few days ago – everything in the post is correct but there are a few other things that may also be worth knowing. Probably the most useful is that the cheapest ferry routes from BsAs to Uruguay go to Colonia. If your final destination is Montevideo or Punta del Este, purchase a ticket with the remaining distance between Colonia and Montevideo included by bus rather than the direct ferry. The buses are also super comfortable and new and clean. The other thing is that we found Colonia Express is the cheapest ticket provider. Anyway, hope you enjoy your trip and if you’re heading to Uruguay soon we may see you around! Thank you for a very informative article, as I am planning a trip to BA this spring, and was considering a 3 days side trip to Uruguay. Since I would prefer to travel without my suitcas, do you know if there is a luggage hold at the ferry in BA? Hey Fred, so happy you found the post useful. The Buquebus terminal does have luggage storage, yes. This is what they say about it on their website: “The Puerto Madero Terminal has a special space to keep you baggage. The cost per day is ARS 50.”. Since we did not use it I’m unsure whether the prices are up to date (they tend to fluctuate a lot in BA) but they definitely do have storage there. Hope you have a great time in Buenos Aires and Uruguay! Thanks for the information, can you also post information about the return trip from Colonia to Buenos Aires? Should you also be in Colonia 1.5 hours before the departure time? We are considering taking a day trip, for a few hours, lunch, etc., but concerned about the extra time involved and whether it will be worth it. Hey John, the return trip is pretty similar just in reverse. You are supposed to be there 1.5 hours before departure time as well according to the ferry company’s info, however as with international flights where you’re meant to be there 4 hours beforehand, it’s usually overkill. I wouldn’t cut it too fine though as you do still need to get your boarding passes printed and go through immigration. That said, this doesn’t usually take very long. A day trip to Colonia from BsAs is quite common and something I have personally done before. It definitely allows you enough time to see the major sights, have lunch and soak up the atmosphere, so it’s well worth doing. Hope this helps, let us know if there’s any other specific info you’d like to know though. I did not see ferry times anywhere ? Hi Roy, if you click on the button that says “Compare Ferry Times & Prices Here” you’ll be able to search the times for the dates that you are intending to go. They depend on the day of travel, time of year, and which service you choose to travel on. Hope this helps. Hi Kim, the ferry port in Colonia is right next to the town – literally less than 10 minutes walk away. So you have lots of options for shops & restaurants. It’s a very beautiful place so if you can carve out a little more time to spend there I don’t think you will regret it. Hey, great post – very helpful. We’re planning to stay one night in Colonia before heading from to MV the following morning – any advice on when the first buses go and if we need to buy tickets at the time we leave or should we buy it advance? Hey Stephen, glad you found it useful. 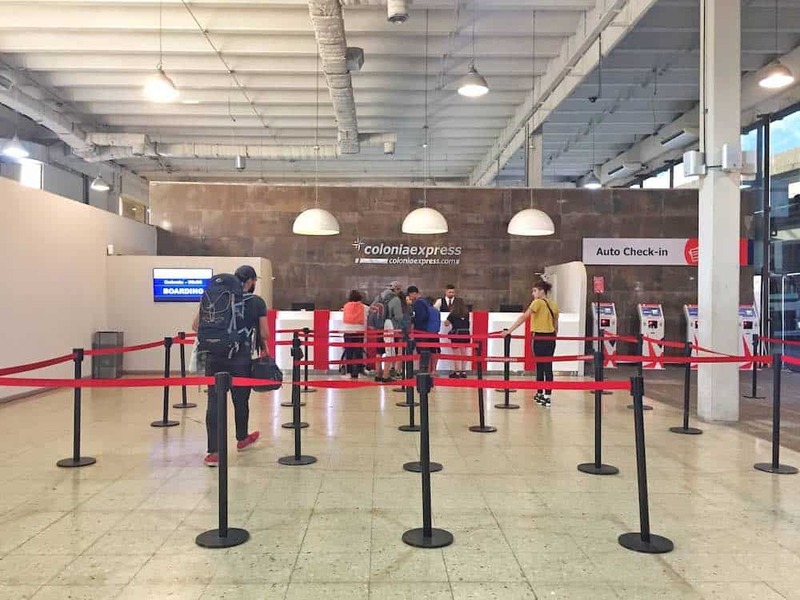 With regards the tickets, you may as well just buy them when you arrive in Colonia – the bus station is only a couple hundred metres down the road from the port so you can head there straight from the boat easily enough. I believe the buses start running at around 5am and they’re extremely regular so you shouldn’t have a problem securing tickets for the service you want. Enjoy Uruguay! Would you happen to also know if pets are allowed on any ferry crossings from Argentina-Montevideo. We would have two dogs with us. Hey Jenny, thanks so much, glad you like the site. We actually saw a few dogs on the ferry so they’re definitely allowed. As for what paperwork you need or whether you have to pay for tickets etc I don’t know I’m afraid. I’d suggest checking directly with the ferry operator you’re planning to travel with for full info. Hope you and the dogs enjoy Uruguay!